Black Friday @ Alchemy | 11.25.16 | rhymeCulture.org | culture. music. news. 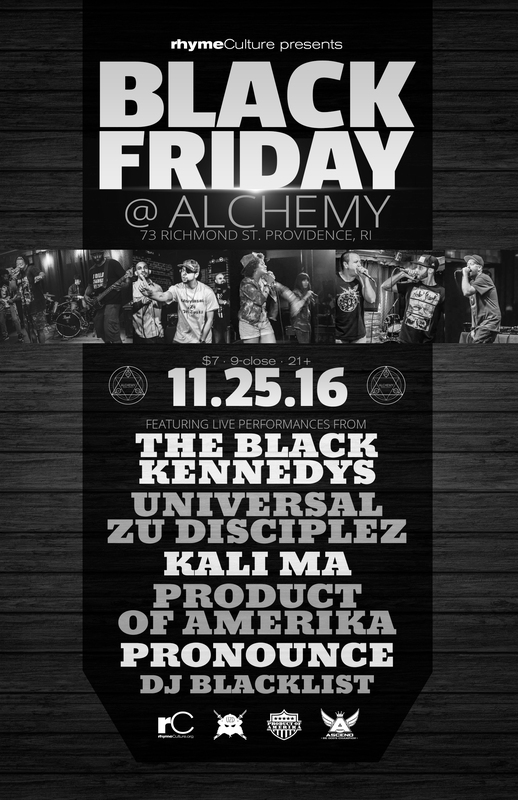 Vibe out with some incredible live Hip Hop, Funk, Rock and more on ‘Black Friday’ 11/25/16 at Providence, Rhode Island‘s newest live music venue, Alchemy! The Black Kennedys, Universal ZU Disciplez, KALI MA, Product Of Amerika and PRONOUNCE w/ Bes Kep will all be performing throughout the night. DJ Blacklist on the 1s & 2s!